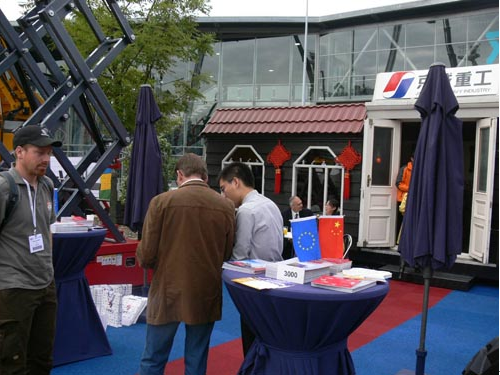 More than 100 access equipment manufacturers from all over the world displayed their latest products in Apex Exhibition. Most of the attendees were professionals with extensive knowledge about aerial working devices. Lots of distributors and people from rental companies attended Apex for new markets and cooperation opportunities. It was the first time for <?xml:namespace prefix = st1 ns = "urn:schemas-microsoft-com:office:smarttags" />China’s access equipment manufacturer Beijing Jingcheng Heavy Industry Co., Ltd to take part in Apex Exhibition, which attracted plenty of attention. Many customers showed their great interests in our products. JCHI sold all the four machines displayed at the exhibition-GTBZ32; a 32m working height self-propelled boom lift, GTJZ08 and GTJZ10; 10m and 12m working height scissor lift and GTWY14; a 14m working height vertical mast lift- to a European dealer before the show. JCHI attended this Apex show to better learn the conditions and regulations of the market and customers service need from Europe. JCHI will explore its international marketing strategies step by step.